Dr Ed Bullmore FRCPsych is the most senior NHS psychiatrist in Cambridge (England), and says a ‘Cartesian divide’ or ‘orthodoxy’ is standing in the way of ‘the new science of immuno-psychiatry’. He invites us to believe that a third of all depressed people, over 100 million worldwide, could be identified with a simple blood test for ‘inflammatory markers’, and ‘be eligible for treatment with a new anti-inflammatory drug’. If I sound sceptical, even cynical, it is with good reason. I have spent many hours listening to drug reps (pharmaceutical company representatives) and, to me, Dr Bullmore’s book could have been written by one. He appears to have worked, half-time, for one of the world’s largest Pharma companies, GlaxoSmithKline, since 2005, and it is no surprise that his rhetoric against ‘professionally conservative’ medicine seeks to create a need for a ‘new’ drug. ‘Aspirin, for example, commonly causes stomach irritation, ulceration and bleeding…a careful doctor in 2018 is likely’ not to use ‘existing anti-inflammatory drugs’ for depression. This is misleading in at least four ways. Firstly, ‘aspirin’ is named three times (and once more, elsewhere), rhetorically foregrounding it as typical, but it is not. For most ‘careful doctors’, an NSAID with less marked side effects would be the first choice for ‘inflammation’. I myself took ibuprofen 3-4 times a day for several months, with no significant side effects, when I had a frozen shoulder. A new NSAID with no gastrointesinal side effects would make a lot of money, so perhaps Dr Bullmore is letting us know that his employer does not have one in the pipeline. Secondly, ‘the clinical trials…have simply not been done’ suggests ‘conservative’, perhaps ‘Cartesian’, medics selfishly want to block ‘transgressive’ and dynamic ‘immuno-psychiatrists’ from helping the 100+ million. The real reason is that ibuprofen and other NSAIDs are out of patent, so non-Pharma funding for the trials would be needed. Thirdly, it is true that ‘a careful doctor in 2018 is likely’ not to use ‘existing anti-inflammatory drugs’ for depression, but that is because of the lack of clinical trials and, in the UK, NICE guidance, not the side-effects of generic NSAIDS. Fourthly, the need for new anti-inflammatories for depression seems less urgent if there is only ‘some evidence that inflamed patients respond less well to anti-depressant treatment with conventional drugs, like SSRIs’. Earlier, there is a more upbeat ‘increasingly clear’ statement on this, but the only citation provided is from 2006, so perhaps the increase of clarity has levelled out in the dozen years since. There is also no mention of evidence that people with ‘inflamed’ depression either respond less to psychotherapy or have less tendency to spontaneously improve. For all I know, the research base outlined for cytokines and other components of the immune response having a mediating, or even sometimes a more directly causal, role in depression may be quite sound. However, Dr Bullmore’s wide-ranging 2009 defence of neurosciency hype in psychiatry means that his account cannot be taken on trust. In this book he repeatedly claims that his ‘post-Cartesian’ approach reduces the ‘stigma’ of depression and other mental health problems: but in 2009 he himself attempted to smear critics using a stigmatising mental health label, as ‘neurophobic‘. Even more self-undermining is Dr Bullmore’s highly selective account of GSK and neuroscience. How can he write about his meeting with the ‘Senior Vice President of Research and Development’ in 2012, but not mention the $3 billion ‘criminal’ and ‘civil’ convictions in the United States, for bribery and fraud which included two antidepressants (Paxil/paroxetine and Wellbutrin/bupropion), in the same year? And worryingly for the reputation of more lowly researchers in the wider field of biological psychiatry, Dr Charles Nemeroff MD, who was sacked by one University in 2008 for lying about large payments from GSK, appears to have serenely carried on as a leading researcher in the field, at another. Dr Bullmore writes that in 2010 GSK suddenly announced it was ‘strategically exiting the whole area of mental health’, and here the account becomes rather opaque. He implies that the supply of new antidepressants dried up across the whole industry: ‘Acting rationally, companies have stepped back, not wanting to put good money after bad’. Unsurprisingly, he makes no reference to the UK’s MHRA criminal investigation into the notorious Study 329, or to CEO Andrew Witty’s knighthood in early 2012 for ‘Services to the Economy’, rather than to Health. 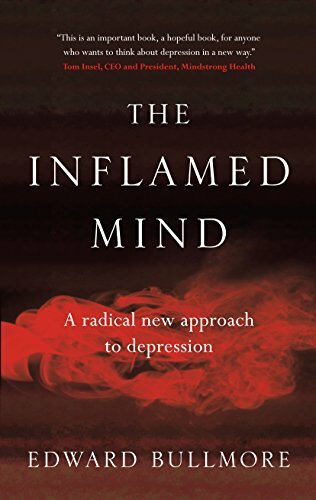 For me, though, the key flaw of this book is the near-absences of the placebo effect in the treatment of mild and moderate depression, whether ‘inflamed’ or not, and the tendency for most episodes to get better anyway, with adequate support. Despite a rare moment of good sense in which Dr Bullmore writes ‘Stress is one of the most well-known, and one of the least understood, causes of depression….a massive effect, especially for…major life events’, I fear that his aim is to prepare the way for new patented drugs to get through the lax regulatory frameworks which exist in both Europe and the United States. Thanks, Neil, I did enjoy your incisive review. I've not read the book, and he may be a huckster, but there is still something interesting in the stress – HPA pathways, I think. – eg work of McEwen, Sheldon Cohen, and Galea's group on stress and epigenetics….